The title of this post is not original and draws from Nate Silver's book on why so many predictions in politics, sports and economics fail. It reflects the skepticism with which I view many 'can't fail" predictors of economic growth or stock markets, since they tend to have horrendous track records. Over the last few weeks, as markets have gyrated, market commentators have been hard pressed to explain day-to-day swings, but that has not stopped them from trying. The explanations have shifted and morphed, often in contradictory ways, but few of them have had staying power. On Tuesday (December 4), as the Dow dropped 800 points, following a 300-point up day on Monday, the experts found a new reason for the market drop, in the yield curve, with an "inverted yield curve", or at least a portion of one, predicting an imminent recession. As with all market rules of thumb, there is some basis for the rule, but there are shades of gray that can be seen only by looking at all of the data. 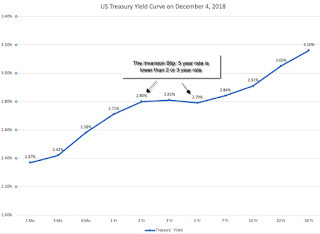 The market freak out is in the highlighted portion, with 5-year rates being lower (by 0.01-0.02%) than 2-year or 3-year rates, creating an inverted portion of the yield curve. 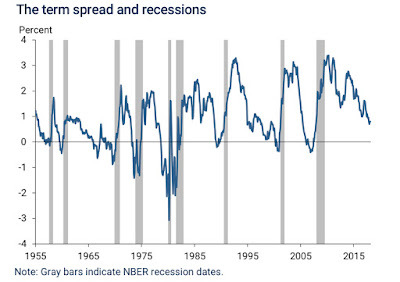 The track record of the inverted yield curve as a predictor of recessions is impressive, since it has preceded the last eight recessions, with only only one false signal in the mid-sixties. 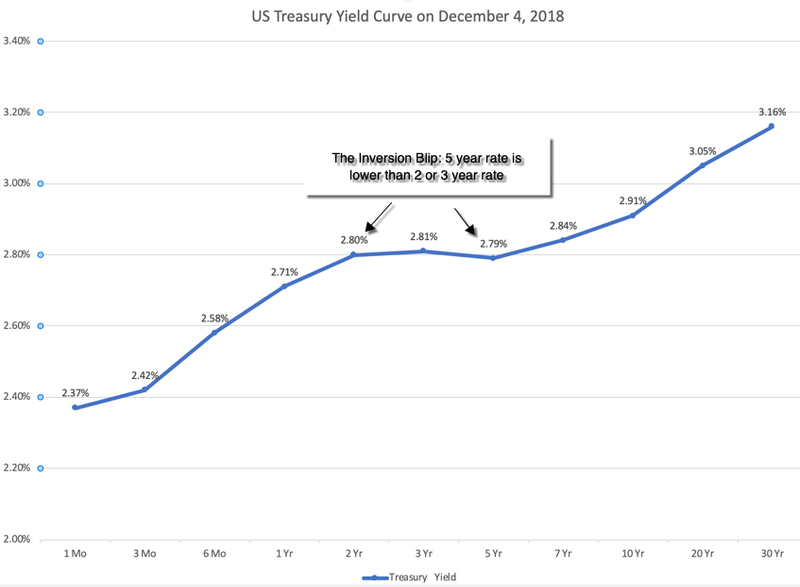 If this graph holds, and December 4 was the opening salvo in a full fledged yield curve invasion, the US economy is headed into rough waters in the next year. 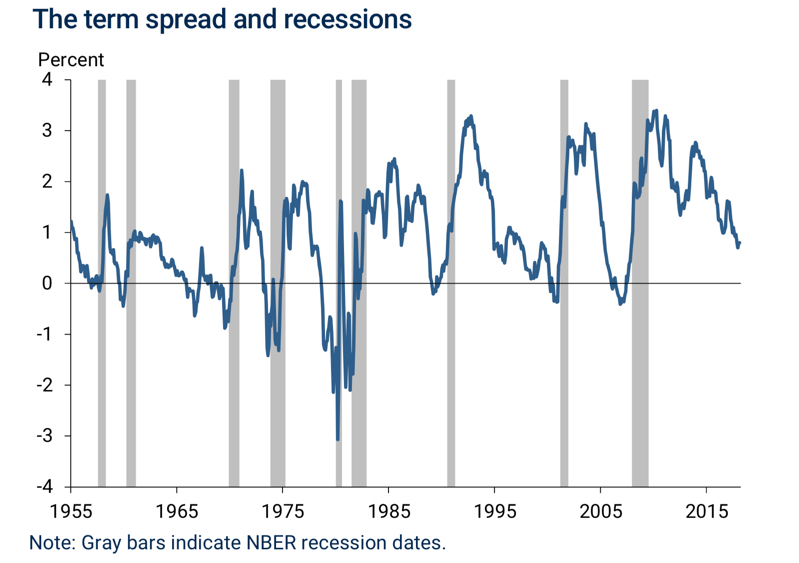 The fact that every inversion in the last few decades has been followed by a recession will strike fear into the hearts of investors, but is it that fool proof a predictor? Perhaps, but given that the yield curve slope metrics and economic growth are continuous, not discrete, variables, a more complete assessment of the yield curve's predictive power for the economy would require that we look at the strength of the link between the slope of the yield curve (and not just whether it is inverted or not) and the level of economic growth (and not just whether it is positive or negative). 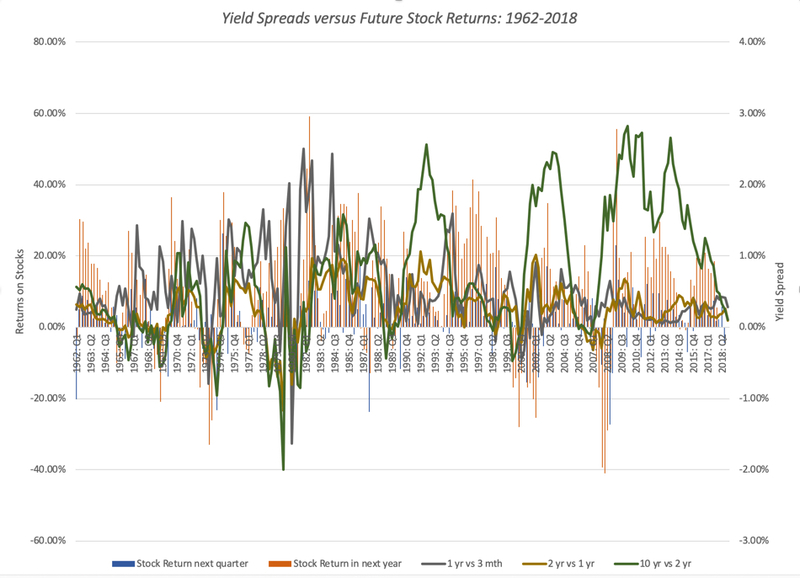 Following up, I look at five yield curve metrics (1 year versus 3 month, 2 year versus 3 month, 5 year versus 2 year, 10 year versus 2 year and 10 year versus 3 month), on a quarterly basis from 1962 through 2018, with an updated number for December 4, 2018. 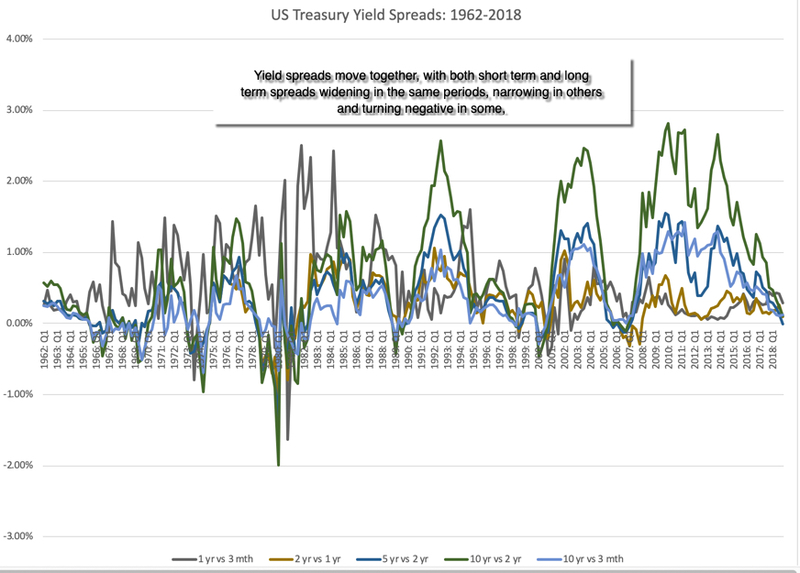 For the most part, the yield curve metrics move together, albeit at different rates. 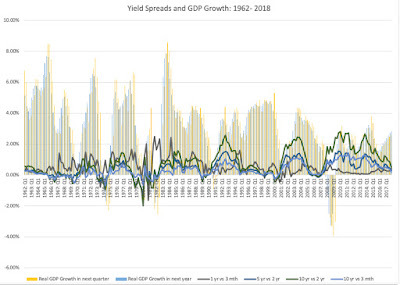 I picked four measures of the spread, one short term (1 year versus 3 month), one medium term (5 year versus 2 year) and two long term (10 year versus 2 year, 10 year versus 3 month) and plotted them against GDP growth in the next quarter and the year after. 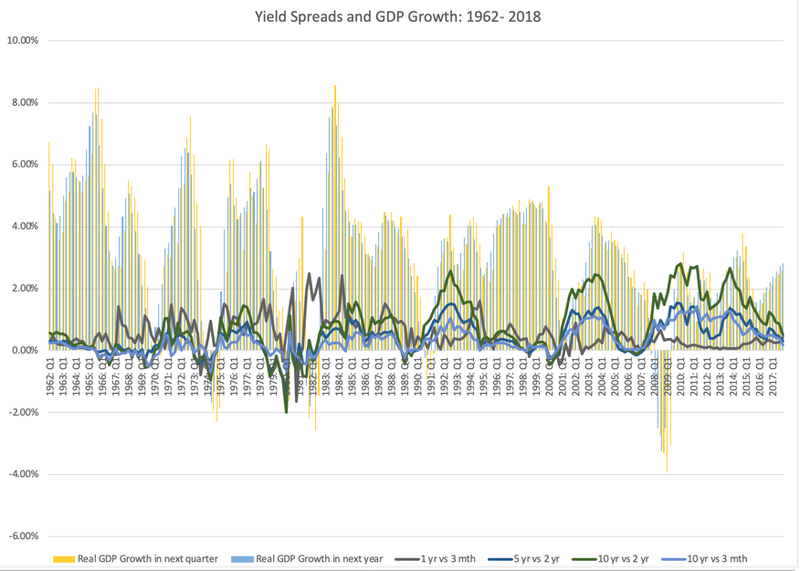 It is the short end that has predictive power for the economy: Over the entire time period (1962-2018), the slope of the short end of the yield curve is positively related with economic growth, with more upward sloping yield curves connected to higher economic growth in subsequent time periods. 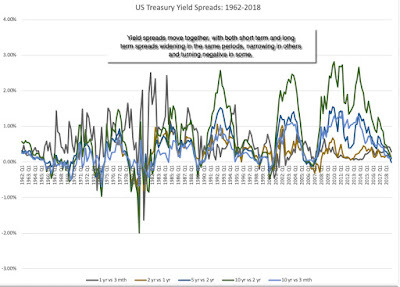 The slope at the long end of the yield curve, including the widely used differential between the 10-year and 2-year rate not only is close to uncorrelated with economic growth (the correlation is very mildly negative). Even that predictive power is muted: Over the entire time period, even for the most strongly linked metric (which is the 2 year versus 1 year), the correlation is only 29%, for GDP growth over the next year, suggesting that there is significant noise in the prediction. And 2008 may have been a structural break: Looking only at the last ten years, the relationship seems to have reversed sign, with flatter yield curves, even at the short end, associated with higher real growth. This may be a hangover from the slow economic growth in the years after the crisis, but it does raise red flags about using this indicator today. 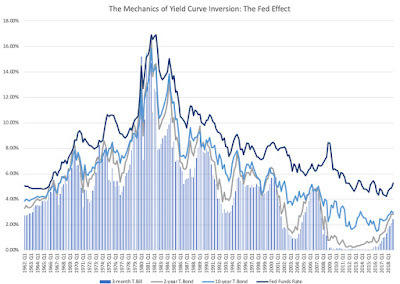 How do you reconcile these findings with both the conventional wisdom that inverted yield curves are negative indicators of future growth and the empirical evidence that almost every inversion is followed by a recession? 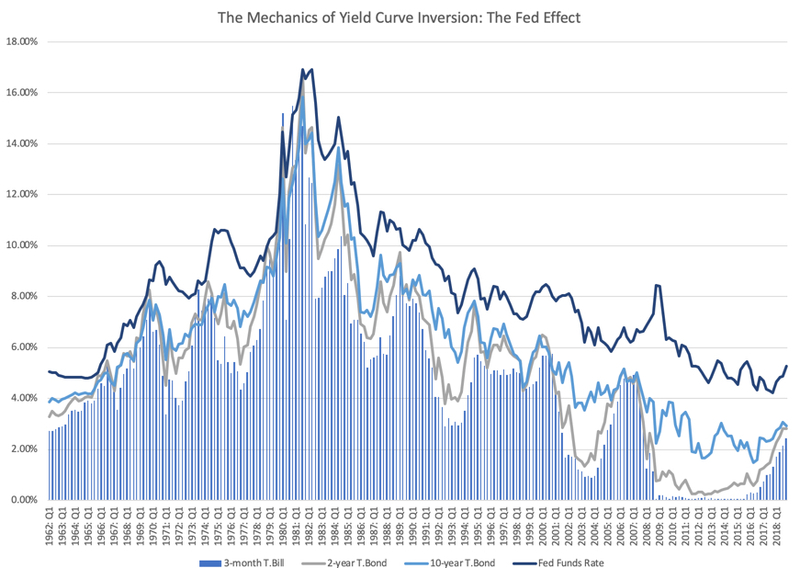 It is possible that it is the moment of inversion that is significant, perhaps as a sign of the Fed's conviction, and that while the slope of the yield curve itself may not be predictive, that moment that the yield curve inverts remains a strong indicator. 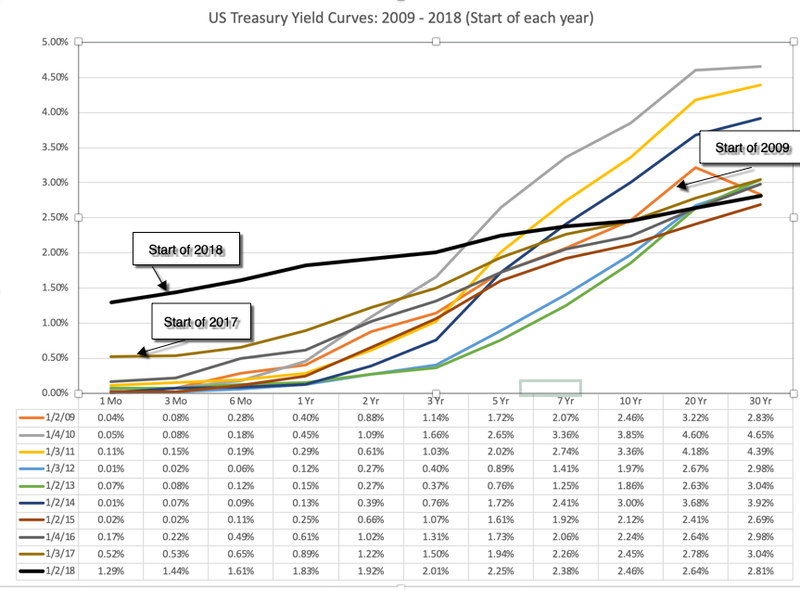 As with the economic growth numbers, if there is any predictive power in the yield curve slope, it is at the short end of the curve and not the long end. And as with the growth numbers, the post-2008 time period is a clear break from the overall numbers. What does all of this mean for investors today? I think that we may be making two mistakes. One is to take a blip on a day (the inversion in the 2 and 5 year bonds on December 4) and read too much into it, as we are apt to do when we are confused or scared. 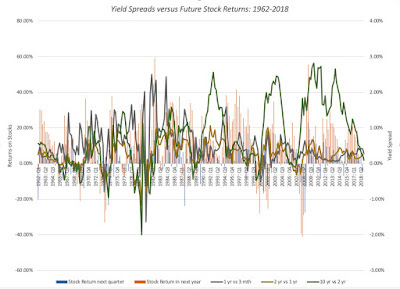 It is true that a portion of the yield curve inverted, but if history is any guide, its predictive power for the economy is weak and for the market, even weaker. The other is that we are taking rules of thumb developed in the US in the last century and assuming that they still work in a vastly different economic environment. 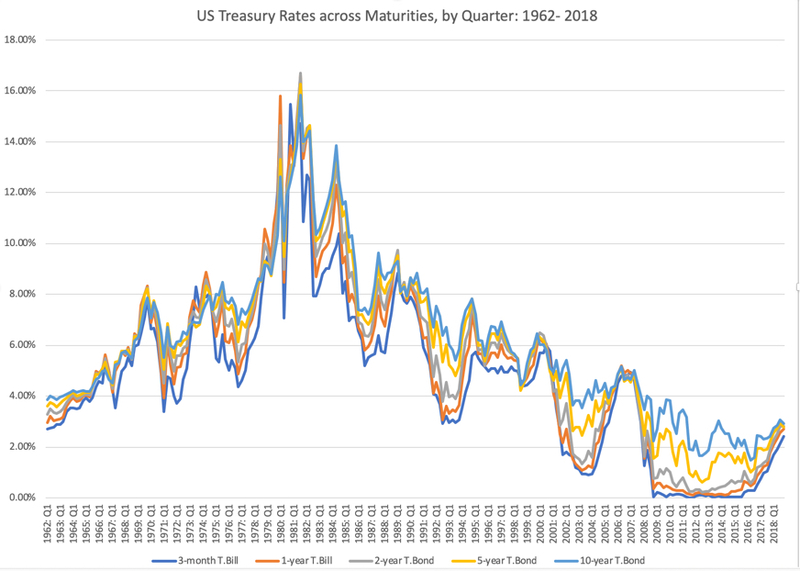 There is information in the slope of the US treasury yield curve, but I think that we need to use it with caution. 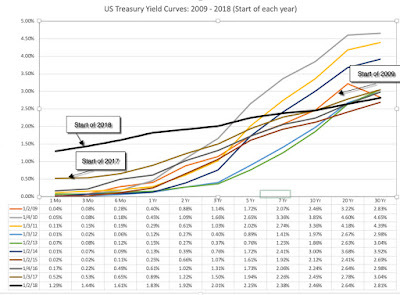 In my view, the flattening of the yield curve in the last two years has been more good news than bad, an indication that we are coming out of the low growth mindset of the post-2008 crisis years. However, I also think that the stalling of the US 10-year treasury bond rate at 3% or less is sobering, a warning that investors are scaling back growth expectations for both the global and US economies, going into 2019. The key tests for stocks lie in whether they can not only sustain earnings growth, in the face of slower economic growth and without the tailwind of a tax cut (like they did last year), but also in whether they can continue to return cash at the rates that they have for the last few years. 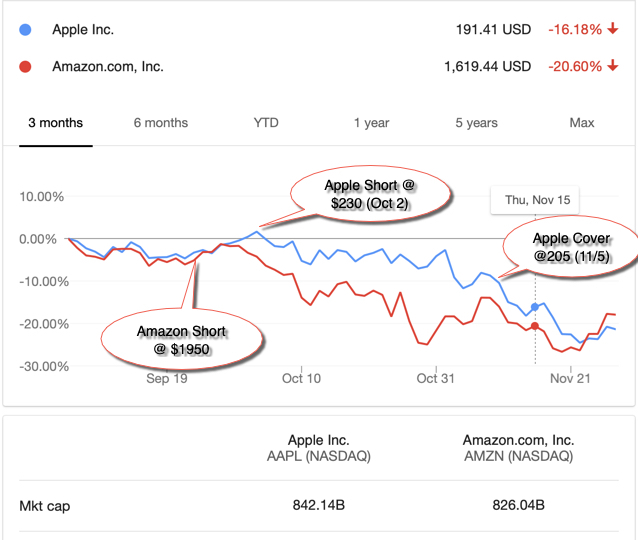 Investing Whiplash: Looking for Closure with Apple and Amazon! 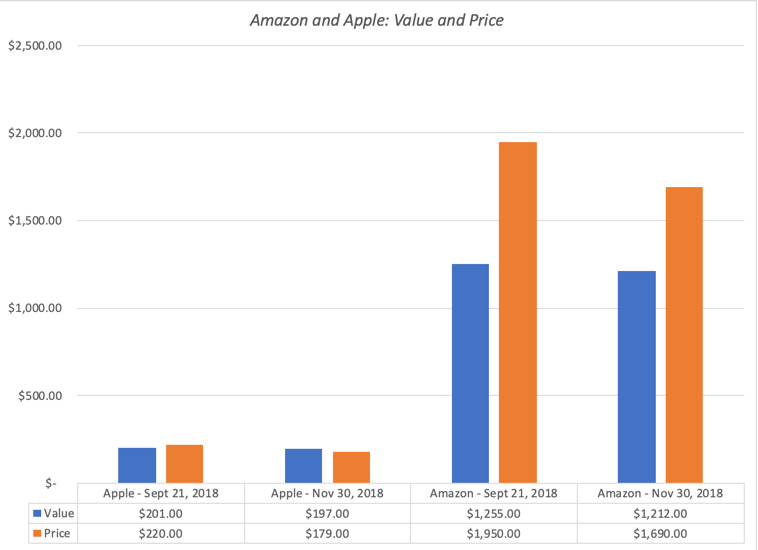 In September, I took a look, in a series of posts, at two companies that had crested the trillion dollar market cap mark, Apple and Amazon, and concluded that series with a post where I argued that both companies were over valued. I also mentioned that I was selling short on both stocks, Amazon for the first time in 22 years of tracking the company, and Apple at a limit price of $230. Two months later, both stocks have taken serious hits in the market, down almost 25% apiece, and one of my short sales has been covered and the other is still looking profitable. It is always nice to have happy endings to my investment stories, but rather than use this as vindication of my valuation or timing skills, I will argue that I just got lucky in terms of timing. That said, given how much these stocks have dropped over the last two months, it is an opportunity to not just revisit my valuations and investment judgments, but also to draw some general lessons about intrinsic valuation and pricing. My Apple short sale which was initiated on October 3 was closed out on November 5 at $205, while Amazon got tantalizingly close to my trigger price for covering of $1412 (with a low of $1420 on November 20), before rebounding. Intrinsic value changes over time: Among some value investors, there is a misplaced belief that intrinsic value is a timeless constant, and that it is the market that is subject to wild swings, driven by changes in mood and momentum. That is not true, since not only do the determinants of value (cash flows, growth and risk) change over time, but so does the price of risk (default spreads, equity risk premiums) in the market. The former occurs every time a company has a financial disclosure, which is one reason that I revalue companies just after earnings reports, or a major news story (acquisition, divestiture, new CEO), and the latter is driven by macro forces. That sounds abstract, but I can use Apple and Amazon to illustrate my point. Since my September valuations for both companies occurred after their most recent earnings reports, there have been no new financial disclosures from either company. There have been a few news stories and we can argue about their consequentiality for future cash flows and growth, but the big change has been in the market. 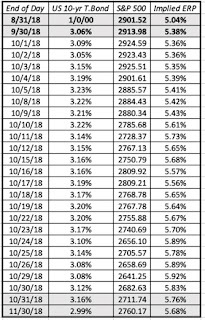 Since September 21, the date of my valuation, equity markets have been in turmoil, with the S&P 500 dropping about 5.5% (through November 30) and the US 10-year treasury bond rate have dropped slightly from 3.07% to 3.01%, over the same period. If you are wondering why this should affect terminal value, it is worth remembering that the price of risk (risk premium) is set by the market, and the mechanism it has for adjusting this price is the level of stock prices, with a higher equity risk premium leading to lower stock prices. 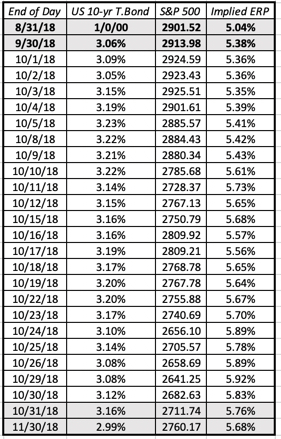 In my post at the end of a turbulent October, I traced the change in equity risk premiums, by day, through October and noted that equity risk premiums at the end of the month were up about 0.38% from the start of the month and almost 0.72% higher than they were at the start of September 2018. In contrast, November saw less change in the ERP, with the ERP adjusting to 5.68% at the end of the month. Plugging in the higher equity risk premium and the slightly lower risk free rate into my Apple valuation, leaving the rest of my inputs unchanged, yields a value of $197 for the company, about 1.5% less than my $200 estimate on September 21. With Amazon, the effect is slightly larger, with the value per share dropping from $1255 per share to $1212, about 3.5%. 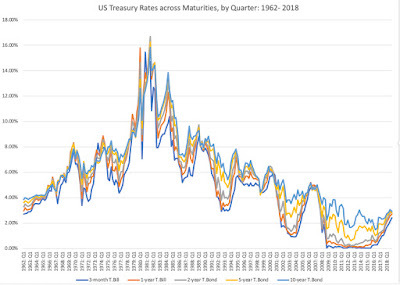 Those changes may seem trivial but if the market correction had been larger and the treasury rate had changed more, the value effect would have been larger. From my perspective, the story for Apple has remained largely the same for the last eight years, a slow-growth, cash machine that gets the bulk of its profits from one product: the iPhone. However, at regular intervals, usually around a new iPhone model, the market becomes either giddily optimistic about it becoming a growth company (and pushes up the price) or overly pessimistic about the end of the iPhone cash franchise (and pushes the price down too much). 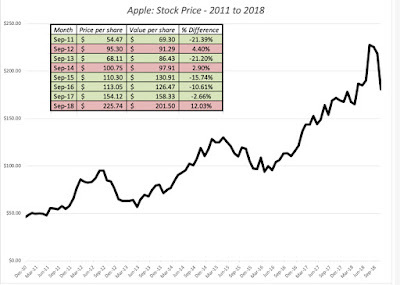 In the face of this market bipolarity, this is my fourth round of holding Apple in the last seven years, and I have a feeling that it will not be the last one. Act with no regrets: I did cover my short sale, by buying back Apple at $205, but the stock continued to slide, dropping below $175 early last week. I almost covered my Amazon position at $1412, but since the price dropped only as low as $1420, my limit buy was not triggered, and the stock price is back up to almost $1700. Am I regretful that I closed too early with Apple and did not close out early enough with Amazon? I am not, because if there is one thing I have learned in my years as an investor, it is that you have stay true to your investment philosophy, even if it means that you leave profits on the table sometimes, and lose money at other times. I have faith in value, and that faith requires me to act consistently. I will continue to value Amazon at regular intervals, and it is entirely possible that I missed my moment to sell, but if so, it is a price that I am willing to pay. And flexible time horizons: A contrast that is often drawn between investors and traders is that to be an investor, you need to have a long time horizon, whereas traders operate with windows measured in months, weeks, days or even hours. In fact, one widely quoted precept in value investing is that you should buy good companies and hold them forever. Buy and hold is not a bad strategy, since it minimizes transactions costs, taxes and impulsive actions, but I hope that my Apple analysis leads you to at least question its wisdom. My short sale on Apple was predicated on value, but it lasted only a month and four days, before being unwound. In fact, early last week, I bought Apple at $175, because I believe that it under valued today, giving me a serious case of investing whiplash. I am willing to wait a long time for Apple's price to adjust to value, but I am not required to do so. If the price adjusts quickly to value and then moves upwards, I have to be willing to sell, even if that is only a few weeks from today. In my version of value investing, investors have to be ready to hold for long periods, but also be willing to close out positions sooner, either because their theses have been vindicated (by the market price moving towards value) or because their theses have broken down (in which case they need to revisit their valuations). As investors, we are often quick to claim credit for our successes and equally quick to blame others for our failures, and I am no exception. While I am sorely tempted to view what has happened at Apple and Amazon as vindication of my value judgments, I know better. I got lucky in terms of timing, catching a market correction and one targeted at tech stocks, and I am inclined to believe that is the main reason why my Apple and Amazon positions have made me money in the last two months. 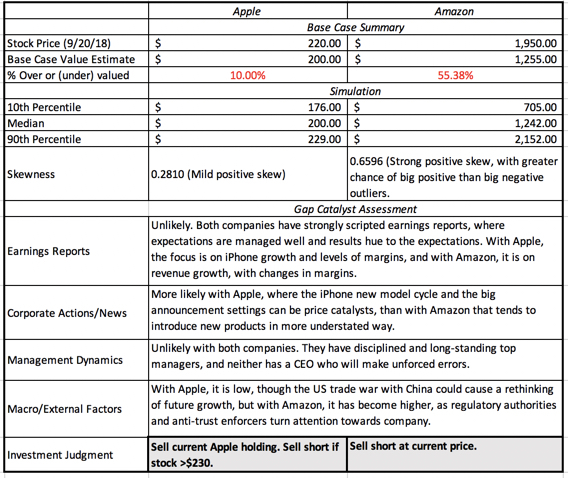 With Amazon, in particular, there is little that has happened in the last two months that would represent the catalysts that I saw in my initial analysis, since it was government actions and regulatory pushback that I saw as the likely triggers for a correction. 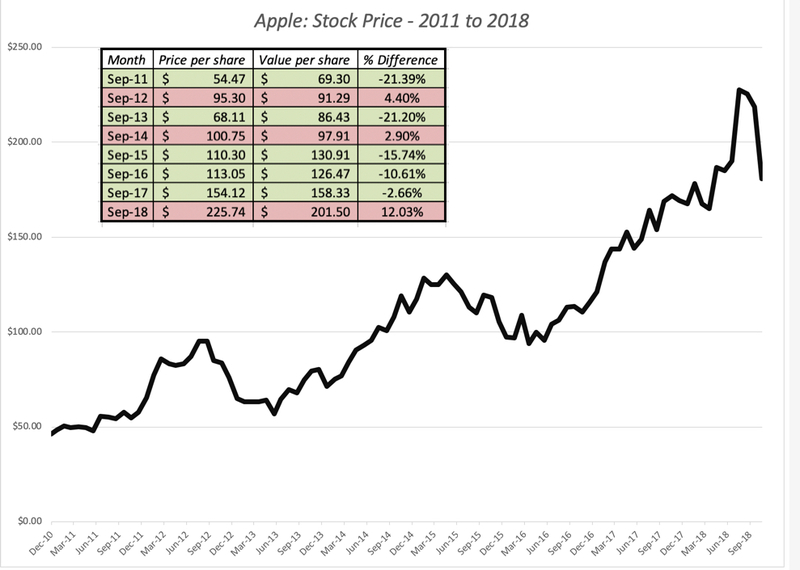 With Apple, I do have a longer history and a better basis for believing that this is market bipolarity at play, with the stock price over shooting its value, after good news, and over correcting after bad news, but nothing that has happened to the company in the last two month would explain the correction. Needless to say, I will bank my profits, even if they are entirely fortuitous, but I will not delude myself into chalking this up to my investing skills. It is better to be lucky than good!